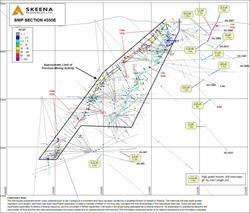 VANCOUVER, BC--(Marketwired - May 17, 2016) - Skeena Resources Limited (TSX VENTURE: SKE) ("Skeena" or the "Company") is pleased to announce drill plans for the 2016 season at the Company's recently acquired past-producing Snip gold property (see news release dated March 23, 2016; option to acquire 100% interest from Barrick Gold Corporation). The exploration program will commence in mid to late summer and up to 3,000 metres of drilling will be completed. Snip was a high-grade underground mine that began production in 1991 and yielded 1,106,500 ounces of gold from 1,250,200 tonnes of ore milled at an average head grade of 27.5 g/t. Due to the high operating costs, exhaustion of economic reserves, and the US$300 per ounce price of gold at the time, the mine closed in 1999. Current gold prices and the vastly improved infrastructure (run-of-river hydro power generated at McLymont Creek and all-season access road now within 20 km) should allow for a significantly lower mine grade cutoff. 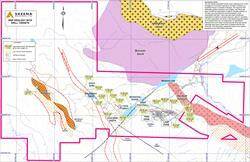 Thus the remaining zones and high-grade targets listed below are considered to have significant up-side potential. 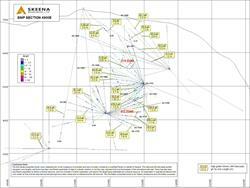 Under the direction of Skeena's Chairman, Mr. Ron Netolitzky, and Mr. Ron Nichols, P.Eng. (both of whom were involved in the discovery and exploration of Snip from 1986 to 1989) the Company has undertaken a review of Barrick Gold Corporation's comprehensive database of historic exploration reports and operational mine information. Numerous exploration targets away from the historic mine workings have been identified and are highlighted below. 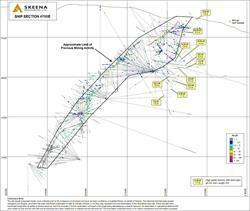 These represent excellent initial drill targets for high-grade resource definition. Monsoon Ridge which is partially drill tested and yielded up to 7.65 g/t Au over 1.4 metres in DDH S-219. 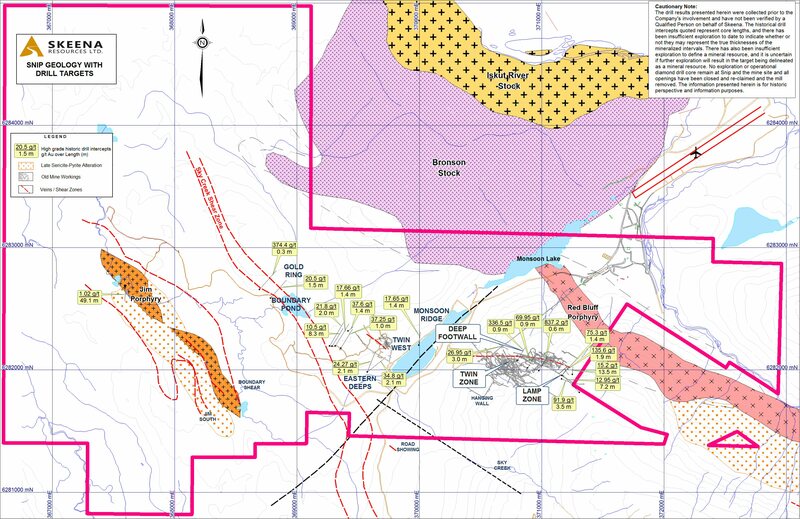 The Jim Porphyry which represents another hydrothermal system with limited drilling that intersected up to 1.02 g/t Au over 49.1 metres in DDH J92-9, indicating potential for a large tonnage, low-grade gold target located on the SW portion of the Snip claims. Exploration target locations as well as an overview of the Geology at Snip can be found on the Snip Geology with Drill Targets map below. 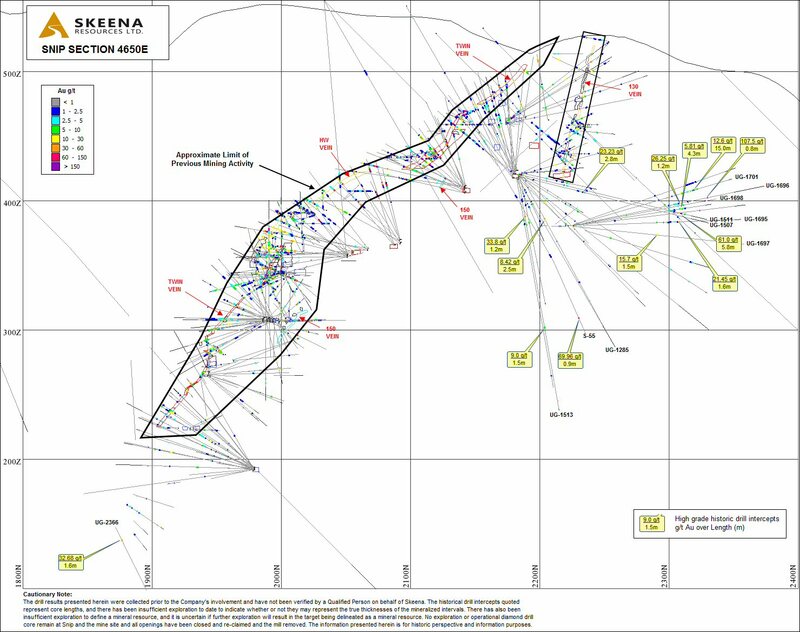 Additional cross sections and maps showing mine workings and drill targets can be found on the Company's website here. Skeena recognizes that the Snip mine is located in the Traditional Territory of the Tahltan Nation and is committed to open and respectful dialogue. The Company is working with the Tahltan Central Government to carry out community engagement regarding the anticipated exploration program. The Company will also initiate archaeological and environmental studies on the project this year. 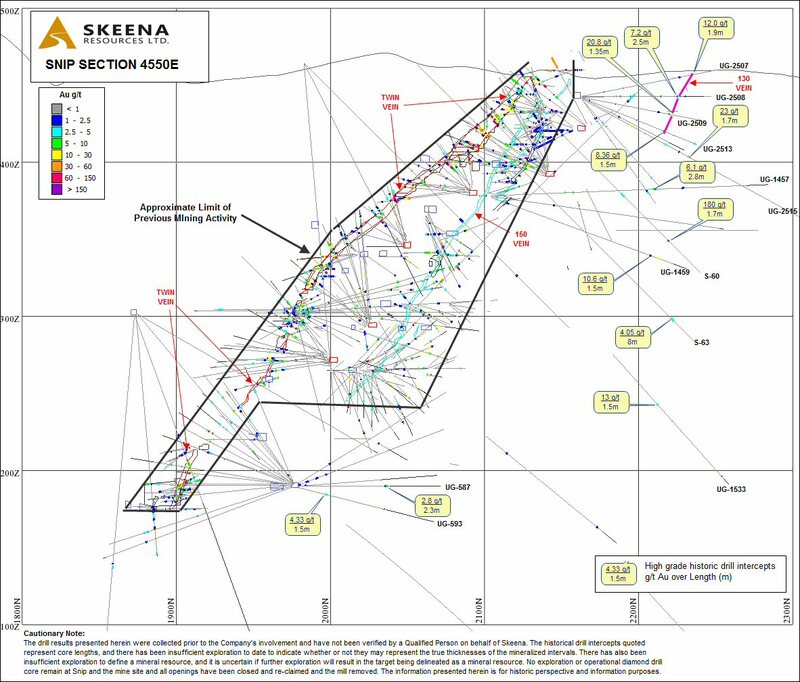 The technical information in this news release has been reviewed and approved by Rupert Allan, P.Geol., Skeena's Vice-President of Exploration and a Qualified Person as defined by Canada's National Instrument 43-101. 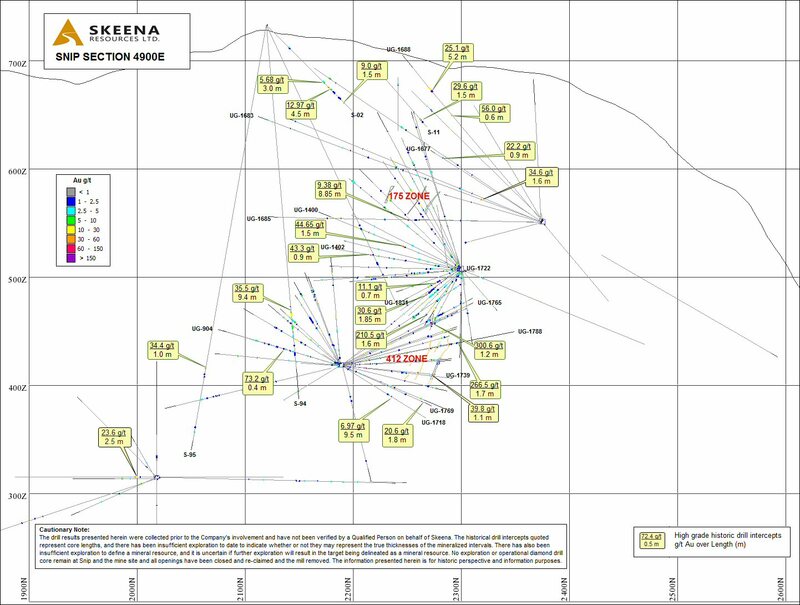 The drill results presented herein were collected prior to the Company's involvement and have not been independently verified by a Qualified Person on behalf of Skeena. The historical drill intercepts quoted represent core lengths, and there has been insufficient exploration to date to indicate whether or not they may represent the true thicknesses of the mineralized intervals. There has also been insufficient exploration to define a mineral resource, and it is uncertain if further exploration will result in the target being delineated as a mineral resource. No exploration or operational diamond drill core remain at Snip and the mine site and all openings have been closed and re-claimed and the mill removed. The information presented herein is for historic perspective and information purposes. 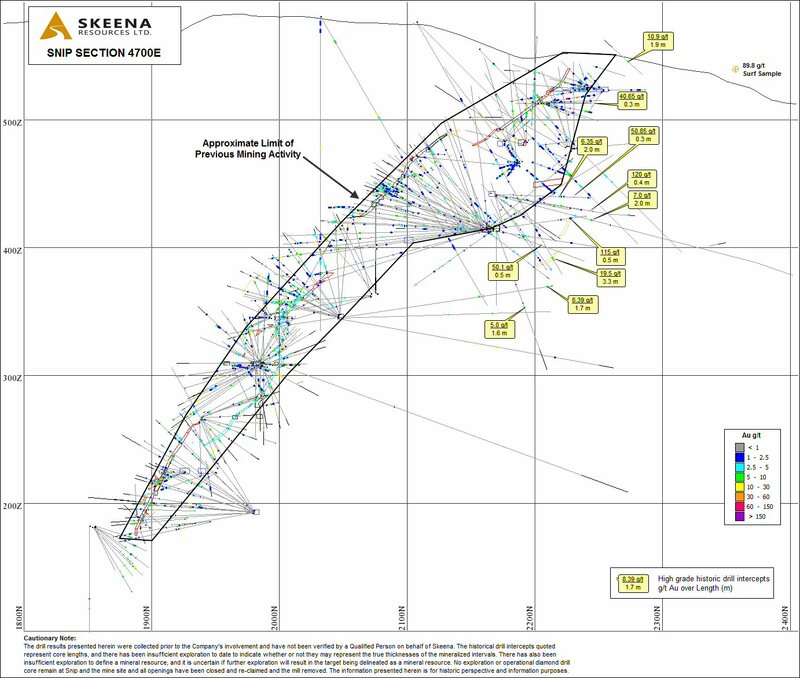 Skeena Resources Limited is a junior Canadian mining exploration company involved in the acquisition, exploration and development of prospective base and precious metal properties throughout British Columbia. The Company's primary activities at present are the evaluation of the Spectrum gold project and adjacent GJ copper-gold project, located in the prolific Golden Triangle of northwestern BC. The Company recently optioned the Snip mine from Barrick Gold Corporation which is also located in the Golden Triangle. Skeena's management includes a highly experienced team of mine-finders, including Ron Netolitzky, Chairman, who was inducted into the Canadian Mining Hall of Fame in 2015. Certain statements made and information contained herein may constitute "forward looking information" and "forward looking statements" within the meaning of applicable Canadian and United States securities legislation, including, among other things, information with respect to this presentation. These statements and information are based on facts currently available to the Company and there is no assurance that actual results will meet management's expectations. Forward-looking statements and information may be identified by such terms as "anticipates", "believes", "targets", "estimates", "plans", "expects", "may", "will", "could" or "would". Forward-looking statements and information contained herein are based on certain factors and assumptions regarding, among other things, the estimation of mineral resources and reserves, the realization of resource and reserve estimates, metal prices, taxation, the estimation, timing and amount of future exploration and development, capital and operating costs, the availability of financing, the receipt of regulatory approvals, environmental risks, title disputes and other matters. While the Company considers its assumptions to be reasonable as of the date hereof, forward-looking statements and information are not guarantees of future performance and readers should not place undue importance on such statements as actual events and results may differ materially from those described herein. The Company does not undertake to update any forward-looking statements or information except as may be required by applicable securities laws. Suite 650, 1021 W. Hastings St.